Before marketing can implement strategies to improve the company’s position, the current situation of the company in relation to its environment should be known. A SWOT analysis is an effective tool to evaluate this situation. 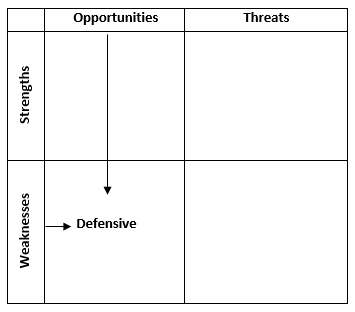 The popular SWOT analysis is an overall evaluation of the company’s strengths (S), weaknesses (W), as opposed to opportunities (O) and threats (T). Strengths and weaknesses are internal and arise from a micro analysis. The latter analyses the company itself. On the contrary, opportunities and threats are in the environment and therefore external. They may result from a macro analysis. Based on the SWOT analysis, strategies can be identified to deal with every potential situation in the best way. Strengths include internal capabilities, resources as well as positive factors that may help the firm achieve its objectives and serve its customers. What is the company good at? What does it do extraordinarily well, and which unique resources does it possess? Examples include the image of a company, its quality or cutting edge design. Things it does particularly well. Strengths are within the organization’s control. Weaknesses refer to internal limitations. They are negative factors that may hinder or interfere with the firm’s performance. What does the company lack in terms of resources and capabilities? And in what way is it limited in reaching its objectives? Examples may be too high costs that force the company to maintain high prices, or bad social image because of pollution. As strengths, weaknesses are within the organization’s control and can therefore be eliminated. Opportunities are, as indicated before, favourable factors or trends in the external environment. They may be available for the company to exploit them to the firm’s advantage. What factors are in the environment that present a unique chance for the company? Examples are that there is a trend in the market for electric cars which is a favourable for a manufacturer of electric cars. As an external element, the organization can normally not take influence or even control opportunities. However, it can react to them. Finally, threats are negative and unfavourable factors in the external environment. They may present obstacles or challenges for the company. What factors in the environment make it difficult for the firm to reach its objectives? This might be socio-cultural burdens, governmental restrictions or competition. As counts for opportunities, threats are also external elements which the company cannot control. Therefore, it has to adapt its reaction to the threats. Just investigating strengths, weaknesses, opportunities and threats apart from each other does not help too much. It is only half of the SWOT analysis. 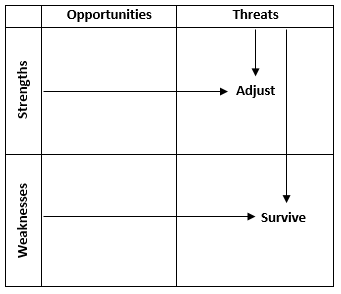 Only when internal factors are combined with external factors, the SWOT analysis can be used to full advantage. The key is to combine strengths and opportunities to gain maximum advantage. At the same time, eliminate or overcome weaknesses and guard against or minimise threats. Strengths are internal positive factors. Thus, they should be maintained, built upon or leveraged. How can we use each strength? Weaknesses are internal negative factors. Consequently, they should be remedied, changed or stopped. How can we stop each weakness? Opportunities are external positive factors. The company cannot control them, so they should be prioritized, captured, built on and thereby optimized. How can we exploit each opportunity? Threats are external negative factors, which the company has no control over either. Thus, they should be either countered, avoided or minimized and managed. How can we defend against each threat? 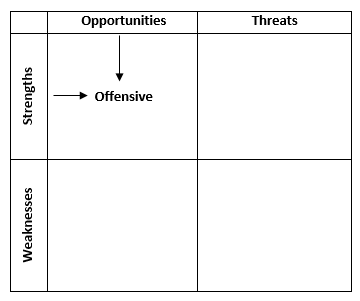 The first strategy derived from the SWOT analysis is called Offensive. If a strength meets an opportunity, the most favourable situation occurs. Indeed, a positive internal factor can be combined with a favourable external factor. This reveals the needed strategy: Offensive. This indicates that the company should make the most of this favourable situation. An example: if the company has low costs and can therefore maintain low prices, and the market demands low-priced products, make the most of this situation: penetrate the market. Secondly, the SWOT analysis leads to a Defensive strategy. In case of a weakness meeting an opportunity, careful consideration is required. The situation presents a risk, against which the company should defend itself. Consequently, the defensive strategy involves that the organization must watch competition closely. By doing that, it can assure that its weakness does not hinder its success in the future. For instance, if the firm has high costs and must therefore maintain a high price level relative to competition, but the market’s demographics offer a high wealth in terms of disposable income etc., the company should better defend against this potentially dangerous situation. Although it may not be a problem in the first place, it could become one if it is not taken care of appropriately. Eventually, the SWOT analysis may reveal situations where strategies of Adjust or Survive are required. If a strength meets a threat, a positive internal factor meets a negative factor in the environment. The result is the strategy Adjust, which means that the company must make full use of its strengths in order to be able to overcome and neutralize the threat. For example, a company may have a high pricing power. This means that people will keep buying its products regardless of changes in the price. However, the market’s wealth could be decreasing. This must be considered a threat for high-priced products. Thus, the company should fully use its strength to overcome the threat. How can it play with its prices to outrun the danger? If a weakness meets a threat, the worst case is reached. It means that a negative internal factor is met by a negative external factor. The resulting strategy is to Survive. This means that the company has to spend utmost attention on carefully managing the situation. It has to be more than aware of the threat. If needed, turn around and adapt in order to prevent a potential disaster. An example are the high prices of a company that cannot be varied due to fixed costs etc. If this is met by a market that does not accept high prices but only seeks low-cost products, there is only one way: turn around. This could be done by either exiting the market and focusing on another one or by redesigning the internal processes to be able to offer lower costs. The SWOT analysis has great potential and can help a business to better understand itself and its environment. Therefore, the SWOT analysis is a very popular tool. As we can learn from these four strategies, the company can gain most when a strength meets an opportunity. However, other, less favourable situations do not mean that all is lost. The crucial point is that the firm has to reach to the situation and make the most of it. Then, the SWOT analysis provides an effective approach to dealing with the company’s strengths and weaknesses in an environment that offers opportunities and poses threats.